Is this Labor's D-Day or are the changes just 'smoke and mirrors'? "Under Labor's reforms, in determining the ongoing detention of a person, the onus of proof will be reversed. A departmental decision-maker will have to justify why a person should be detained against these values that presume that that person should be in the community." "In our view the critical and harsh aspect of the Howard government's mandatory detention policy was not the initial detention phase but the continued and indefinite detention that occurred while lengthy immigration processes and appeals were completed." The Immigration Minister's speech was comprehensive and announced a shift from a blanket mandatory detention policy to a selective mandatory detention platform, welcome news indeed. But, as confirmed by Evans during an ABC The World Today interview with Alexandra Kirk, the changes can be implemented without legislative change, just through administrative and regulatory review. Labor cannot or will not risk political upheaval by presenting legislation that requires an adjustment of the Migration Act. Regrettably, while these changes in approach to detention are substantial, and on some level represent even a retreat from Labor's intent with its mandatory detention as introduced in 1992, Labor maintains its "underclass" of unannounced boat arrivals, the changes do not touch the massive 4,600 island excision zone, and while they suggest a mothballing of the Christmas Island detention centre, the keys for this John Howard Asylum Gulag will be available at a moment's notice. For more comments see also our media releases below. This page contains the Immigration Minister's full speech and his press release, followed by the media responses that followed thick and fast during the day. The treatment of asylum seekers has been controversial in Australian political debate for many years. The length and conditions of their detention has been a particular focus of criticism. The Rudd Labor Government was elected on a platform that included a commitment to reform and a more humane treatment of those seeking our protection. We quickly ended the Pacific Solution - closing the offshore processing centres on Nauru and Manus Island. We abolished temporary protection visas - the symbol of the former government's continued punishment of those found to be owed our protection. We acted quickly to resolve the legacy cases. Cornelia Rau has finally been compensated for her treatment and Robert Jovicic - the man found destitute in Belgrade after being deported on character grounds - has been given a permanent visa to get on with his life in Australia. The challenge for Labor, having tackled the worst excesses of the Howard immigration legacy, is to introduce a new set of values to immigration detention - values that seek to emphasise a risk-based approach to detention and prompt resolution of cases rather than punishment. The best deterrent is to ensure that people who have no right to remain in Australia are removed expeditiously. The Labor Party went to the last election with a commitment to maintain a system of mandatory detention and the excision of certain places from the migration zone and both commitments will be honoured. Control and management of our borders is integral to the nation's security. The extensive patrolling of our borders by Defence, Customs and other law enforcement agencies has been maintained at existing levels. The Labor Government has reinvigorated efforts to work closely with countries to our north to combat people-smuggling and prevent attempts at dangerous sea journeys by people seeking to enter Australia unlawfully. We look to extend assistance to those countries to develop their capacity and enhance projects in home and transit countries to assist people displaced by conflict who may be vulnerable targets of people-smugglers and traffickers. An architecture of excision of offshore islands and non-statutory processing of persons who arrive unauthorised at an excised place will remain. Those unauthorised arrivals will be processed on Christmas Island. Labor believes that the excision and offshore processing at Christmas Island will signal that the Australian Government maintains a very strong anti peoplesmuggling stance. It also reinforces in the minds of our neighbours that strong commitment and the value we place on their cooperation. Although no decision has been taken on the boundaries of the current excision zone, the Rudd Government believes that a strong border security regime is in the national interest and supports the integrity of our immigration system as well as our humanitarian and refugee programs. Labor rejects the notion that dehumanising and punishing unauthorised arrivals with long-term detention is an effective or civilised response. Desperate people are not deterred by the threat of harsh detention - they are often fleeing much worse circumstances. The Howard government's punitive policies did much damage to those individuals detained and brought great shame on Australia. Strong border security and humane and risk-based detention policies are not incompatible. They are both hallmarks of a mature, confident and independent nation. There has been strong criticism of the processing of protection claims by those persons whose unauthorised arrival was at an excised offshore place. These criticisms include that there is a lack of transparency, that there is insufficient provision for independent advice and assistance for people in making their claims, that there is no independent review of departmental decisions and there is a lack of independent oversight of the process. In instituting a new processing regime for those who arrived in an excised place and claim protection, we seek to remedy those deficiencies. Henceforward, asylum seekers will receive publicly funded advice and assistance, access to independent review of unfavourable decisions and external scrutiny by the Immigration Ombudsman. These measures will build on strengthened procedural guidance for departmental decision-makers. In totality, these robust processes will deliver outcomes in which we can be confident and will reassure the world that we are meeting our international commitments. The integrity of these processes will reinforce our capacity to expedite the return to their home country of people found not to be in need of protection. The previous government was forced into major changes to its detention practices in 2005 following the Palmer and Comrie reports and heightened political and public pressure. The changes certainly improved key aspects of the immigration detention system, reducing overall numbers detained by encouraging the department to issue bridging visas to avoid placing people in detention. However, the changes were largely superficial and never fundamentally reformed the system; many of the concerns expressed over the past decade remain. The basic premise that people who were in the country unlawfully - whether they be unauthorised arrivals or people who have breached their visa conditions - were subject to mandatory immigration detention remained central to the government's policy. Even though the number of unauthorised boat arrivals had slowed dramatically, long-term detention became the reality for large numbers of detainees; mostly people who had breached their visa conditions and utilised our thorough appeal processes to try to win the right to stay in Australia. Today I want to announce that Cabinet has endorsed a policy containing seven values that will guide and drive new detention policy and practice into the future. These values will result in a risk-based approach to the management of immigration clients. Labor's reforms will fundamentally change the premise underlying detention policy. Currently persons who are unlawful may be detained even though the departmental assessment is that they pose no risk to the community. That detention may be prolonged. Currently, detention is too often the first option, not the last. Under Labor's reforms, persons will be detained only if the need is established. The presumption will be that persons will remain in the community while their immigration status is resolved. If a person is complying with immigration processes and is not a risk to the community then detention in a detention centre cannot be justified. The department will have to justify a decision to detain - not presume detention. Labor believes that the retention of mandatory detention on arrival of unauthorised arrivals for the purpose of health, identity and security checks is a sound and responsible public policy. Once checks have been successfully completed, continued detention while immigration status is resolved is unwarranted. The key determinant of the need to detain a person in an immigration detention centre will be risk to the community - a modern risk management approach. The detention of those who pose unacceptable risks to the community is selfevidently sound public policy. Those with criminal or terrorist links or those whose identity is unknown may be so categorised. Detention of those who repeatedly refuse to comply with visa conditions can also be justified, particularly immediately prior to their planned involuntary removal. Detention in these three circumstances is necessary in ensuring the integrity of our immigration system. The other detention values will ensure that detention policy reflects the values of Australia's democracy. They honour our international treaty obligations. They give greater voice to our commitment to the rule of law. They acknowledge the centrality of the humane treatment of the individual. The detention of children behind razor wire and the obvious damage done to them caused outrage in the Australian community. The Howard government could not defend that practice but never abandoned the option of again detaining children. Labor's detention values explicitly ban the detention of children in immigration detention centres. Children in the company of family members will be accommodated in immigration residential housing (IRH) or community settings. The expansion of community housing options and the resolution of definitional issues around what constitutes detention under the Migration Act will be pursued as priorities. The set of values adopted are designed to drive the development of a very different detention model. The values commit us to detention as a last resort; to detention for the shortest practicable period; to the rejection of indefinite or otherwise arbitrary detention. In other words, the current model of immigration detention is fundamentally overturned. The Immigration Department has commenced work on an implementation plan to give effect to these values that will be developed in consultation with community interest groups and agencies such as the Human Rights and Equal Opportunity Commission (HREOC) and the Ombudsman. Under Labor's reforms, in determining the ongoing detention of a person, the onus of proof will be reversed. A departmental decision-maker will have to justify why a person should be detained against these values that presume that that person should be in the community. In our view the critical and harsh aspect of the Howard government's mandatory detention policy was not the initial detention phase but the continued and indefinite detention that occurred while lengthy immigration processes and appeals were completed. Recently, I personally reviewed - in conjunction with the Commonwealth Ombudsman - all of the long-term detention caseload, those who have been in detention for more than two years. In doing the review I sought to apply the values endorsed by Cabinet to the consideration of these protracted and difficult cases. Of the 72 cases reviewed, 31 were placed on a pathway to visas, 24 will be removed from the country and 17 people were subject to ongoing legal proceedings at the time of the review. The lessons from this process were instructive. Firstly, in my judgment, at least 31 of the 72 should not have been in detention. Secondly, in two years and sometimes much longer, we had failed to successfully remove from the country 24 people who should be removed. The integrity of the system demands prompt removal of people who have no legal right to remain. Thirdly, extensive and slow legal processes were resulting in people remaining in long-term detention. Fourthly and most importantly, it was clear that if you asked the question 'is there a need for this person to be in detention?' you got a very different outcome to that provided by the current system. In future the department will have to justify why a person should be detained. Once in detention a detainee's case will be reviewed by a senior departmental official every three months to certify that the further detention of the individual is justified. I will also be seeking to engage the Ombudsman in the review of cases much earlier than his current review after two years of detention. Subject to consultation, a review by his office after a period such as six months would seem more preferable. In the meantime I have asked the department to review all current detainees and apply the same principles used during my review of the 72 people held in long-term immigration detention. Our new model will not solve all of the complex and protracted issues that delay resolution of immigration status. There will still be people in detention, but we should see fewer people in detention for less time. The section 501 character cancellation caseload represents a particularly difficult ongoing cohort. However, our new processes should ensure much better outcomes overall. The cost of long-term detention and the case against the current system are compelling. The impacts on both the physical and mental health of the detainees are severe. Recent research undertaken by the Centre for Health Service Development at Wollongong University dramatically highlights the deleterious health impacts of long-term detention. The cost to the taxpayer of detention is massive and the debt recovery virtually non-existent. 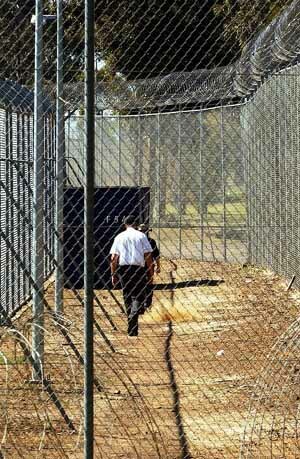 In 2006-07, it cost some $220 million to operate Australia's immigration detention system. Enormous damage has been done to our international reputation. On 14 occasions over the last decade, the United Nations Human Rights Committee made adverse findings against Australia in immigration detention cases, finding that the detention in those cases violated the prohibition on arbitrary detention in article 9(1) of the International Covenant on Civil and Political Rights. Immigration department staff have been left bruised by the policies they have been asked to implement and the public has lost confidence in the fairness and integrity of our immigration system. A great deal more work needs to occur to develop a modern and robust system for management of people in immigration detention. Immigration detention not only needs to be for the shortest duration possible but also in the least restrictive form appropriate to an individual's circumstances. The current detention options, beyond immigration detention centres, are limited and inadequate and the infrastructure is ageing and inappropriate. The Government is interested in broadening alternative detention strategies, most particularly community-based options. The work of the federal parliamentary Joint Standing Committee on Migration will be critical in examining alternative pathways and taking forward a reform agenda. The detention infrastructure available to government is seriously inadequate. The closure of the infamous Baxter and Woomera centres, while welcome, has meant the major capacity to house detainees beyond Villawood is the new centre on Christmas Island. Its ability to accommodate 400 people with a surge capacity of 800 makes the Christmas Island facility essential to responding to any major increase in unauthorised arrivals. Designed in 2001, it represents a maximum security environment. Labor has moved quickly to convert the old Phosphate Hill facilities on Christmas Island to provide for children and families in a community environment and fencing around these facilities has been pulled down. Small groups of unauthorised arrivals will be accommodated in the Phosphate Hill facilities with the new centre to be brought on line when numbers demand. Urgent works are commencing at Villawood out of current budget resources prior to a major redevelopment. The HREOC criticisms of existing facilities at Villawood are totally justified. Priority is being given to the Stage 1 section and the management support unit. These facilities make management of the detainees extremely difficult and contribute to their alienation. The management of detention centres has been at the centre of the concern about treatment of detainees. Labor determined in opposition to return management of detention services to the public sector. On coming to office in December last year, the tender process for the management of detention centres was well advanced. The Immigration Department has invested $13 million in the tender process to date and tenderers have also expended considerable costs in preparing their bids. The post-Roche Report (2005) regime has greatly improved oversight of facility management. The new service delivery model for which tenders are sought has a strong focus on human rights, effective programs and activities for people in detention, high delivery service standards and best-practice governance arrangements. The department has also engaged in extensive consultations in developing the new model. The absence of alternative public service providers would require the extension of the current contract arrangements for a minimum of two years. The cancellation of the tender process would expose the Commonwealth to potential compensation claims from the tenderers. After weighing up all the issues and costs, and giving detailed and serious consideration to the options available, the Government has determined to finalise the current tender process. The department has extended the existing contracts while the current tender process is completed. The broader policy issues of public versus private sector management of detention services will be addressed following an evaluation at the end of the term of the contracts concluded as part of the tender process. Our focus moving forward will be on the implementation of the new detention values and new models for detention. The work of the Joint Standing Committee will help lead that conversation. In the broader community, interest in these matters has waned as the number of unauthorised boat arrivals has significantly reduced. It is worth noting that of the current detention population of 357 - the lowest numbers since March 1997 - only six are unauthorised boat arrivals. The vast majority of our detention population are people who overstayed or breached their visa conditions. We will continue to expect that people who come to our country enter and leave in accordance with their visa conditions; we will continue to pursue the prompt return of those found not to be owed protection. As a result we will continue to have a detention population featuring non-citizens who are a risk to the community or who are refusing to comply with immigration processes. And with massive displacement of persons in the Middle East and Asia, caused by conflict and natural disasters along with well established peoplesmuggling operations, the potential for large numbers of unauthorised arrivals remains real. Australia's national interest demands we continue our efforts to prevent people-smuggling to our shores. The key determinate of our success in combating people-smuggling remains the cooperation and capacity of our northern neighbouring countries. The Minister for Home Affairs, the Hon Bob Debus, and I will lead a senior Australian Government delegation to four South East Asian countries next week to build on the work already serving us well. The policy initiatives I have detailed today are the beginning of a new approach, introducing new and more compassionate values to our detention policies. Labor believes that this framework will both meet our border security needs and deliver appropriate treatment for those who arrive unauthorised or breach their visa conditions. Those who need protection will get it, those who do not will be expected to promptly leave Australia. The Rudd Labor Government will reform our immigration detention policies and the treatment of asylum seekers in a way that reflects the compassion and tolerance of the Australian community. In the future the immigration system will be characterised by strong border security, firm deterrence of unauthorised arrivals, effective and robust immigration processes and respect for the rule of law and the humanity of those seeking migration outcomes.